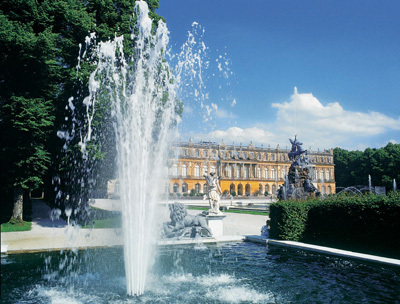 Herrenchiemsee was built in a splendid position by king Ludwig II starting on May 21st 1878. The castle in fact rises on an island of lake Chiemsee, the Herreninsel, and can be reached by ferry leaving from the town of Prien. Herreninsel, the Island of men, is so called because it used to host a convent of Augustinian Canons a counterpart to the nearby Fraueninsel, the Isle of Women, which is still the home of a Benedictine Convent of women. The great interest nurtured by Ludwig towards the ‘Roi Soleil’ and the French Royal family goes further than a simple historical remembrance or a passionate veneration so to say: Louis XVI of France had been the Godfather of his grandfather, King Ludwig I of Bavaria. The untimely death of the forty year old sovereign, on June 13th 1886 in the lake of Starnberg in circumstances which have never been clarified, did not allow to carry out and to complete the project. Today Herrenchiemsee is in fact made up of only the central body: the left wing, unfinished was demolished in 1907 whereas the right wing was never even started. The visit to the Bavarian Versailles starts first with the great staircase of honour. 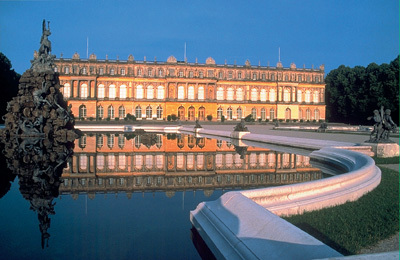 Though a model for Herrenchiemmsee, Versailles did not always correspond exactly to what Ludwig had in mind. I fact he asked for new creations in the trend of the 19th century: the great staircase reproduces the one of the ambassadors in Versailles but has a very different mould on account of the modern glass roof. The hall of the guards is the first of the representation rooms for parades. It is richly decorated in golden stuccos and precious marbles, and is also adorned with halberds of the royal guard, the so called Hartschiere. In the white wood and gold lining of the first antechamber are inserted pictures with scenes of Louis XIV th’s time while in the big fresco on the ceiling the triumph of Baccus and Cerere is represented. The magnificent wardrobe with gilt bronze applications is made with the technique of artist Boulle. In the court protocol, the parade bedroom was the place where evening and morning audiences took place: it was not simply a place where to sleep and rest, but the central focus of the castle. This one in Herrenchiemsee is something extraordinary: stuccos, furnishings and materials are of such wealth difficult to put into words. 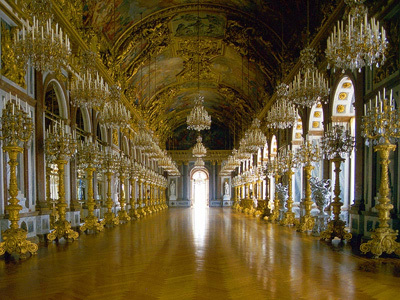 The hall of mirrors, 98 metres long (the Versailles one is only 73), 52 branched candlesticks, 33 Chandeliers, is the jewel of the castle, some art critic thinks it is better than the original one. created in order to avoid bothering the king while he was having his meals. In 1927, King Ludwig II’s Museum was set with photographs, paintings, letters, personal items and original furnishings, many of which came from Munich’s Residenz where the sovereign lived with a certain regularity during the first years of his reign, before he started gradually to move into his castles. Either before or after your visit to the castle, make sure you stop at the former Abbey of the Augustinian Canons, which was bought by Ludwig together with the island in 1873. Inside it you can visit some baroque halls, witnessing the prestige of the Canons that lived in Herreninsel from 1130 up to 1803. Don’t miss the king’s small private apartment and the room where in 1946 sat the commission in charge of writing out the Constitution of the German Federal Republic. 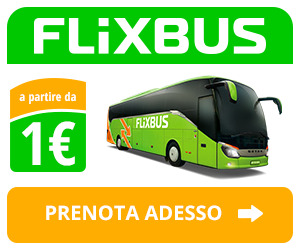 Opening times: From April till End of October from 9 a.m to 6 p.m.
From end of October till March from 10 a.m to 4 p.m. In Winter, if the lake is frozen, the castle might not be accessible. Closures: January 1st, Mardi Gras, Decembre 24th, 25th and 31st. How to get there: By train as far as Prien + small steam train + ferry to Herreninsel. By car from Munich to Herrenchiemsee you must follow this route. Tickets: If you wish to visit several castles and state palaces in Bavaria, the best solution would be to buy a Pass for two weeks or for a year.